BlueStacks 4, the latest version of the popular Android emulator for Windows, has now been released to the stable channel. The new version is built upon Android 7.1.2 Nougat and is said to bring a significant performance boost over its predecessor. 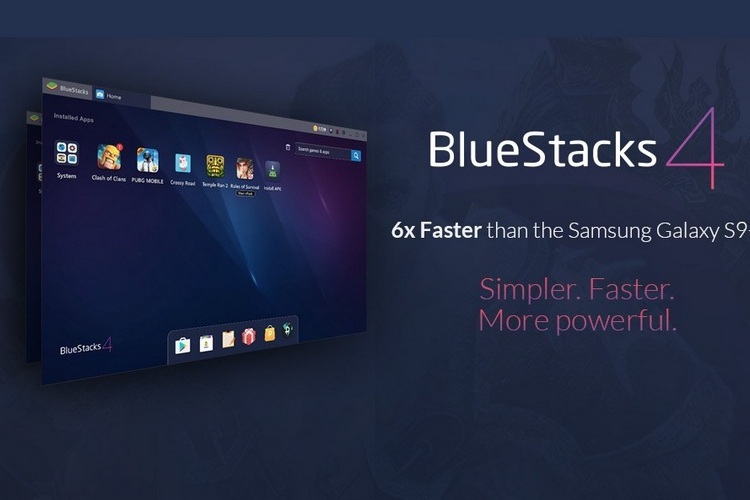 BlueStacks 4 features Hyper-G Graphics for enhanced visuals and according to the developers, is 6x faster than the Samsung Galaxy S9+. The developers further claim that the software is much faster than the “any mobile on Earth”. 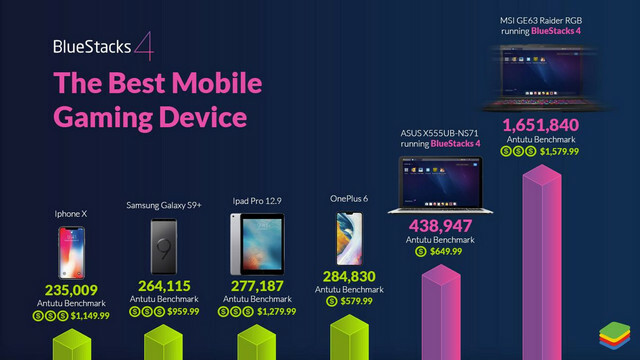 Gaming is clearly the main focus area of BlueStacks 4, as it has been for recent versions of the software. That being the case, BlueStacks Systems says that the latest version comes with ‘AI-driven resource management for low-latency gaming’. The company further says that the update brings a number of additional under-the-hood changes for enhanced gaming performance. Smartphones have come a long way since Steve Jobs unveiled the first-gen iPhone more than a decade ago. Even entry-level handsets these days are an order of magnitude faster and more capable than super-expensive devices just a few years back. However, PCs continue to hold an edge when it comes to sheer processing and graphics power. That exact point in illustrated perfectly in the graphic below, which shows that even a run-of-the-mill $650 laptop can be twice as fast as the Galaxy S9+ or the OnePlus 6. With something a bit more powerful, like MSI’s GE63 Raider RGB, the Antutu benchmark shows a dramatic 6x gain in performance over the aforementioned Android flagships, not to mention the iPhone X. While synthetic benchmarks hardly tell the full story, the significant variance in scores does suggest that BlueStacks 4 is certainly a significant improvement over v3, so in case you’re interested, you can download it on your Windows PC by clicking this link.